AARON MATE:	It’s The Real News. I’m Aaron Mate. The Defense and Security Equipment International, DSEI, is one of the world’s largest arms fairs. Its guest list includes the world’s top 10 weapons companies and governments from all over the world. It begins in London on Monday amid a storm of protests. At least 15 activists were arrested on Tuesday as part of a week of action. SPEAKER:	… protesters on there so they can deliver it to the arms fair. They’re moving the vehicle with activists on it. AARON MATE:	Joe Lo is the research coordinator at the Campaign Against the Arms Trade, CAAT, and took part in this week’s protest. Welcome, Joe. JOE LO:	Thanks for having me. AARON MATE:	Thanks for joining us. So, in that brief little clip we saw right there, activists were blockading a truck with another vehicle on it. Can you describe what’s going on there? JOE LO:	We’ve had to protest every day this week in the lead up to the arms fair, which starts next week. So, we’re trying to blockade both entrances to the arms fair’s exhibition center in order to stop the arms fair going ahead. So, there’s been a permanent occupy camp at one end of the arms fair and people have been protesting on both entrances and exits to the arms fair. They’ve been locking themselves to military equipment going in. People have been running on top of trucks to try and stop the trucks getting in and trying to block the roads so this arms fair cannot take place. AARON MATE:	One of the pieces of military equipment that the activists have tried to black, as we just showed in a headline from The Electronic Intifada, is an Israeli military vehicle. Can you talk about why activists have focused on that one? JOE LO:	We saw that coming in. That was one that was a big day of action that was focused on Palestinian rights and on Stop Arming Israel. The protesters there saw this Plasan vehicle coming into the arms fair and they decided to block it and get in front of it in order to stop it being taken into the arms fair where any regime present could buy one of those to repress their own populations. We’ve got Saudi Arabia on the guest list, we’ve got Bahrain, the UAE, Vietnam, Colombia also, and some countries which have been either dictatorships or involved in human right abuses or both. So, protesters decided that they wanted to stop that vehicle going in. 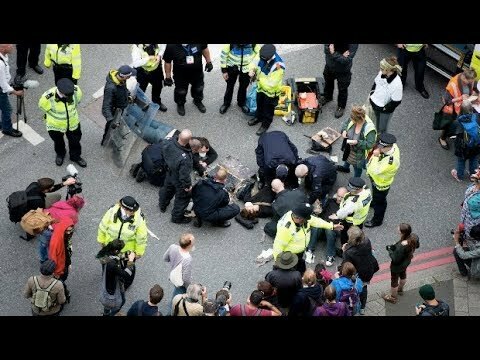 AARON MATE:	The common phrase that we’ll hear about the guest list is that it’s “a who’s who of human rights abusers.” Can you talk about what kind of opposition the British government has faced for allowing the arms fair to be hosted in London and the overall controversy around this fair? JOE LO:	Yeah. The British government doesn’t just allow it to take place. The British government organizes it and puts taxpayer’s money behind it. There’s an obscure body, even in the UK, it’s obscure, called the DIT DSO, which is the government’s arms promotion body. That helps organize this arms fair. It’s a civil service body and the civil servants spend their time organizing arms fairs, flying abroad and trying to promote British-made equipment to all sorts of regimes around the world. There has been a lot of controversy. This arms fair is very unpopular among Britain’s people and all the poll winning we’ve had shows that. There’s been opposition for politicians as well. They believe that Jeremy Corbyn has opposed arms sales to Saudi Arabia. He’s a longtime supporter of Campaign Against Arms Trades. There’s also the London mayor, Sadiq Khan. He’s called for the arms fair to be shut down. Basically, the government and the Tories are the only party that supports arms promotion and arms exports to countries like Saudi Arabia, which abuse human rights and which bomb other countries. AARON MATE:	Speaking of arms exports, around the world, Britain is known as having strong regulations, rules governing the sale of arms, linking them to protections of human rights. So, is there a certain irony here in having all these regimes come to London to purchase arms? JOE LO:	I think I’d reject the idea that the UK has a strong export control system. AARON MATE:	I didn’t say system, I said reputation. JOE LO:	Reputation, perhaps, yeah. If it does have a reputation, it’s not a deserved reputation. The UK government sells weapons to Saudi Arabia, which has committed awful atrocities in Yemen. If you’re sending weapons to Saudi Arabia, that’s the worst that you can get. But there is definitely an irony in what you say. There’s an irony in the UK’s image abroad, an image it tries to promote of a country which promotes human rights when, in fact, it welcomes human rights abusers with open arms as long as they’ve got the cash to buy weapons. So, there definitely is a hypocrisy and a distance between how the UK promotes itself and what the UK’s actually like. AARON MATE:	Now, your group was recently involved in a court action to try to stop the British government from selling weapons to Saudi Arabia. What is currently being done right now to try to get Britain to enforce its supposed strong arms control laws, barring the sale of weapons to governments that attack civilians? JOE LO:	There’s a legal case. We took it to the High Court and were not successful in the first instance in the High Court. The judges found that the government, they gave them enough leeway to make the decision that it might have been legal to sell to Saudi Arabia. But we firmly dispute that decision and we are challenging that in the courts. We’re pursuing an appeal and that appeal process is currently ongoing. Hopefully, we’ll be able to challenge that again in the higher court, the Court of Appeal. Apart from the legal campaign, we’re campaigning politically to stop arming Saudi Arabia. We just had a general election recently and every opposition party which has MPs, bar one party, the Democratic Union that’s in Northern Ireland, every other party opposed arms exports to Saudi Arabia. So, we were hoping that there can be a political solution. We can argue about what’s legal, but at the end of the day, the government decides what’s legal. To a certain extent, the government makes the laws. If we had a new government with a better line on Saudi Arabia, we could be successful that way. AARON MATE:	Finally, just to give an example, we talked a bit earlier about that Israeli armored vehicle, Plasan. On its website, it advertises that it has, quote, “The vehicle has field-proven experience.” What does that mean? JOE LO:	Yeah. Field proven is a term we hear constantly with Israeli weaponry, as well as “battle-tested”. That’s the other phrase that they use. What that means is that it’s been used in the field. It’s been used either in the West Bank or in Gaza to attack civilians in the West Bank to uphold the Israeli occupation, to put down resistance to their occupation. If it’s a drone, it means it’s been used to hover over Gaza and maybe to shoot missiles down on the people below. So, that means this weaponry has been active in perpetuating injustice and repressing people, causing occupation, causing conflicts. That is seen as a plus for Israeli weaponry. That’s what they market it as. AARON MATE:	Field proven. Joe, finally, speaking of in the field, you guys have been out there protesting all week. The arms fair officially begins on Monday. What’s going to happen this week? JOE LO:	We’ve got another big day of action on Saturday. It’s the weekend, so we can get more people down. Then we’re going to have another day of action on Sunday. No, it doesn’t stop. Then the arms fair begins on Monday, Tuesday, Wednesday, Thursday, Friday, and there’ll be further protests and there’ll be further comedy nights. We’re going to have an exhibition of art against the arms fair and all sorts of fun things like that. We’ll also be obviously campaigning on social media. We’ll be talking to MPs trying to get these issues raised in Parliament. We’ll be campaigning strongly against this arms fair and trying to shut it down for good. AARON MATE:	Joe Lo, the research coordinator at the Campaign Against the Arms Trade, who took part in this week’s protest against the arms fair. Joe, thank you.